Tahtlan rally in August, 2012, against Red Chris Mine, in northern ‘BC’. Totogga Lake, BC – Concerned members of the Tahltan Nation have set up a road block on Highway #37, 80 km south of Dease Lake, BC at the Tatogga Lake Resort. 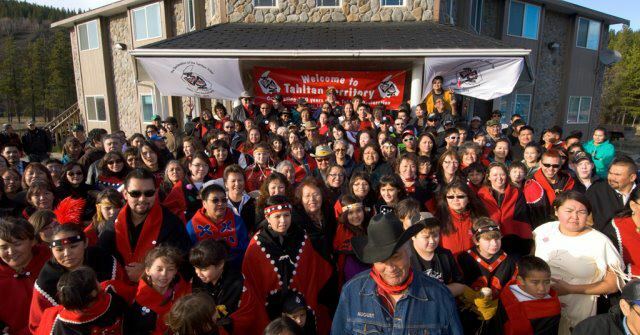 The Red Chris Mine is within the territory of the Tahltan Nation who have occupied territory since time immemorial. The specific area where the Red Chris Mine is being constructed is home to many species of animals including Stone Sheep, Mountain Goat, Moose and Caribou. The Tahltans depend upon these animals for subsistence and believe that the mine will destroy the animal’s habitat and calving grounds that is sacred to the Tahltans. The Tahltan Leadership has spoken out strongly against the mine and criticized the BC mine permitting process that is viewed as corrupt. The BC Liberal Government has given free rein to mining companies leaving the environment vulnerable to contamination and disruption. Tahltans have serious concerns with the design of the tailings ponds and the potential for leakage and wide scale environmental disasters that will result should tailings leak into the environment. At the Tahltan Central Council Annual General Assembly held in July 2012 a resolution was passed to develop a No Red Chris Campaign to oppose the Red Chris Mining Project. Two Tahltan women Kukdookaa and Adanza’a will be at the blockade with other elders and concerned Tahltans handing out information and educating those travelling along Highway #37 about the critical issues facing the Tahltans and their homelands. Adanza’a is a 73 year old great grandmother on the blockade to protect her homeland for her grandchildren so that they can enjoy what we have today without the destruction mining will bring. She said that, “Our ancestors fought and died for our homeland to protect our way of life for us and the least we can do is fight for our rights and the rights of generations to come. Kukdookaa is also a grandmother who believes in fighting for the rights of the Tahltan Nation and will go to any length to protect the Tahltan people, wildlife, fish, and the environment. “It is irresponsible of the BC Government to provide permits while serious issues remain unresolved with the people who occupy the area.” Wild game outfitters, resort owners and other business people also have concerns with the location of the road and the disruption to wildlife and the pristine wilderness. Posted on August 31, 2012, in Mining and tagged Indigenous resistance, native blockades, native resistance, Red Chris Mine, Tahltan, Tahltan blockade. Bookmark the permalink. Leave a comment.